This post is a continuation of foods inspired by my trip to Asheville, NC, for the Food Blog Forum conference. 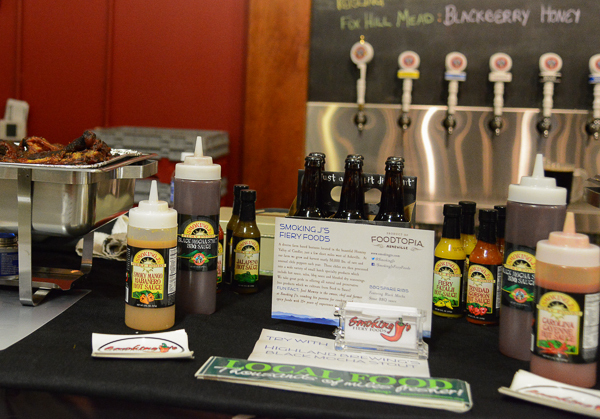 The second day of the conference was hosted by Explore Asheville Foodtopia. 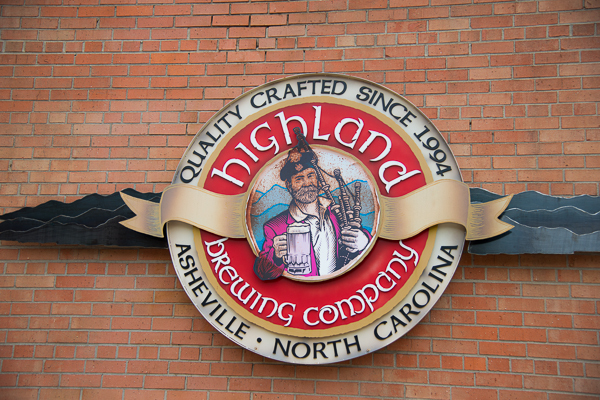 The day began with a visit to a local brewery, the Highland Brewing Company. I had no idea that Asheville is home to more artisan breweries than any other place in the U.S. We were given the opportunity to tour the actual brewery and watch the beer making and bottling activities in action. The tour was nice, but what really floored me was the reception that was waiting for us when we arrived. Many of the local restaurants and food purveyors had stations set up with samples of their specialties matched with various Highland Brews. Ribs and beer for breakfast? It was tough, but somehow I managed. 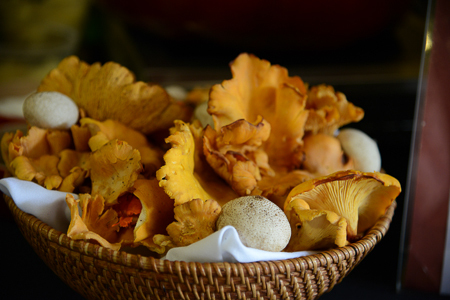 There were representatives from the local honey purveyors, ice cream makers, and even a professional forager, who had brought a sample of the most beautiful mushrooms I’ve ever seen. The Foodtopia group also gave us a very nice bag full of some of the local goodies, to include a bottle of Smokin J’s barbecue sauce. Early this past summer, I decided I needed to improve my grilling skills. Actually, I decided to become a “grill goddess,” and purchased a couple of grilling cookbooks to assist me, including a copy of Gastro Grilling by Ted Reader. I really like this book because it goes well beyond the throw-a-steak-on-the-grill version of outdoor cooking. 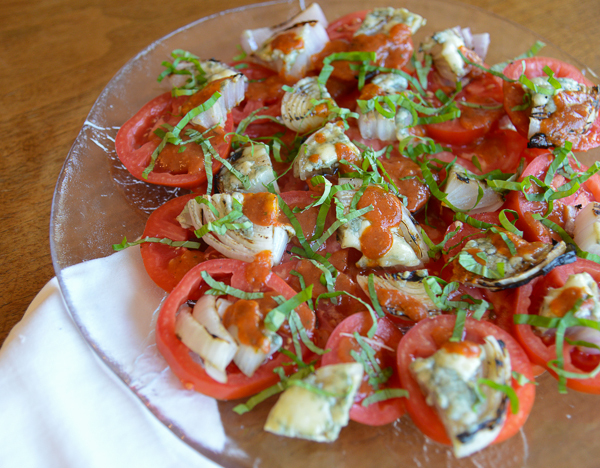 I spotted this salad recipe early on, and decided it would make a great side with grilled meats. 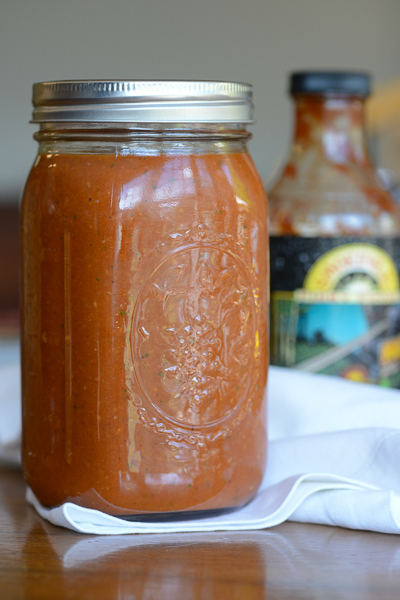 The barbecue vinaigrette reminds me of french dressing, only better. It’s great on a simple green salad as well. If you live in a climate warm enough to still be enjoying some early fall tomatoes, and you’re crazy like us and grill outside year ‘round, this salad is for you. Even if you live somewhere that you have already experienced your first snowfall, there is always next year. 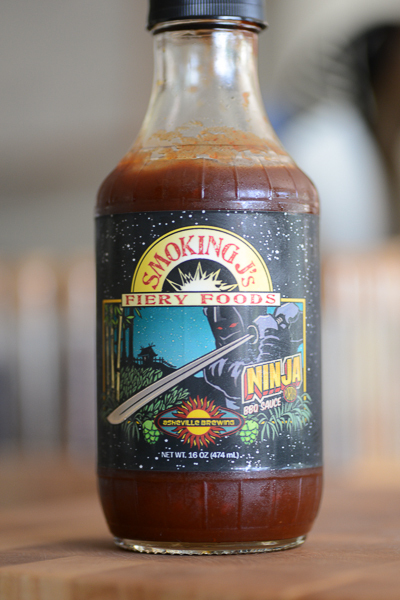 I used Penzey’s Barbecue spice for the salad dressing. If you don’t have access to Penzey’s feel free to substitute your favorite barbecue rub combined with a pinch of sugar. This salad is great with a mixture of different heirloom tomatoes of different colors, but use whatever you can find. If you prefer to use only one type of onion, all red, for example, that’s okay too. To chiffonade basil, tightly roll the leaves lengthwise and slice thinly. Prepare the vinaigrette: place the first eight ingredients (through the barbecue spice) in a food processor and pulse until smooth. Turn on the food processor and slowly add the olive oil through the feed tube, stopping the machine when the vinaigrette is smooth and completely emulsified. Transfer to a bowl, season to taste with salt and pepper, and set aside. Preheat the grill on high. 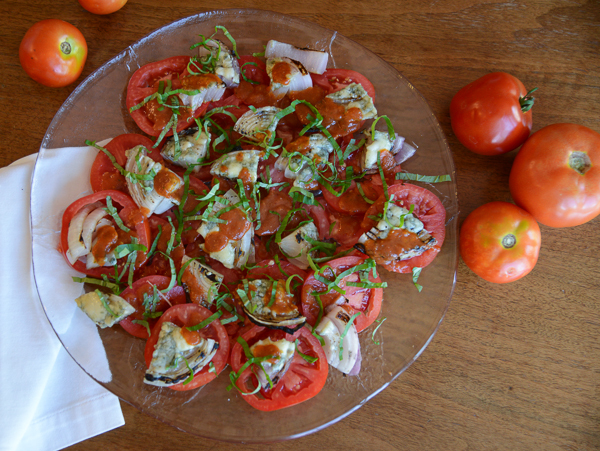 Thickly slice the tomatoes and arrange on a serving platter. Slice the onions into 1/2-inch thick slices. Brush both sides with olive oil and season with salt and pepper. Grill the onions on one side for 6 minutes, then turn them over and grill for another 5 minutes. They should be fairly tender and slightly charred. 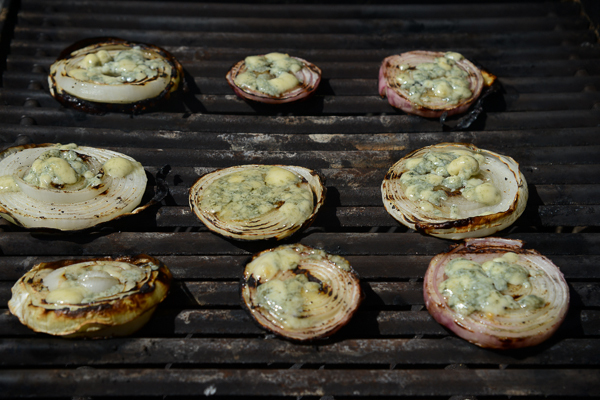 Sprinkle some of the blue cheese on each onion slice and close the lid for about a minute to melt the cheese. Carefully remove the onions from the grill and allow to cool for a couple of minutes. Cut the onions into quarters and arrange on top of the tomatoes. Drizzle the salad with some of the dressing and serve the remainder on the side. Top the salad with the basil and serve. 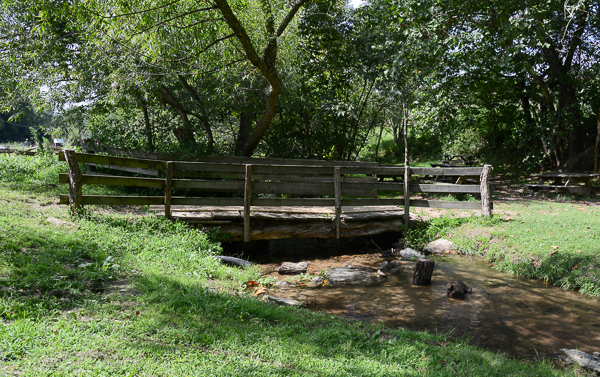 I love fall – going outside that first crisp morning when the temperature is in the 50s in complete contrast to the 80s and 90s we’ve previously experienced in the DC area. This year has been different, however. We’ve had such a mild summer that now that the temperature has dropped, I find myself almost thinking I can’t appreciate it, because it just hasn’t been that hot. Wow, Jeannine. The one summer on record with decent temperatures and you think it needs to be hotter. Let’s throw in some heavy-duty humidity while we’re at it, shall we? So, I guess what I’m getting at is that, on this last day of summer, I’m not ready to throw in the towel on summer yet. There will be plenty of time for braises, pumpkin, soups and all those foods that signify fall later down the road. 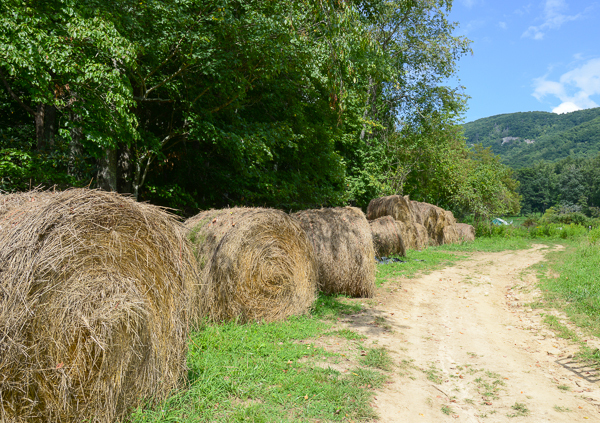 One of the stops on the Explore Asheville Foodtopia tour during the recent Food Blogger Forum was a visit to Hickory Nut Gap Farm. 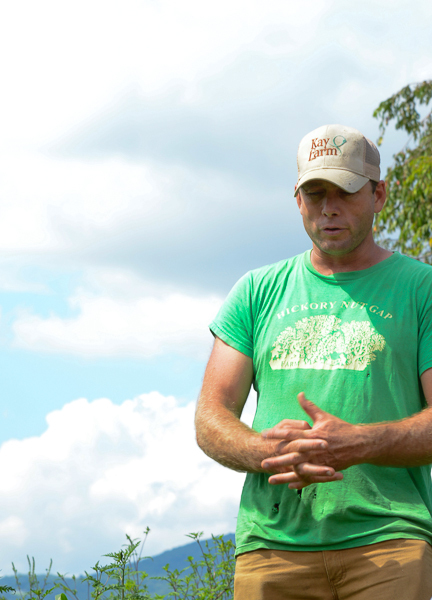 We were treated to a sample of their delicious grass-fed beef before touring a section of the farm, led by Jamie Ager, one of the co-owners of the farm. These hamburgers were inspired by the visit to the farm. I think you’ll agree when you taste these is that there is just no substitute for grass-fed beef – it just tastes, well, beefier. And you can’t argue with the health benefits of eating meat that provides essential Omega 3 fatty acids. I’ve been following Juli Bauer of PaleOMG ever since my husband and I first started experimenting with the Paleo/Primal lifestyle 3 years ago. Although neither of us is completely Paleo, I still follow Juli’s blog and find it a great source of healthy recipes, no matter what eating program you follow. I’ve really enjoyed seeing how she has grown as a cook over the past few years. 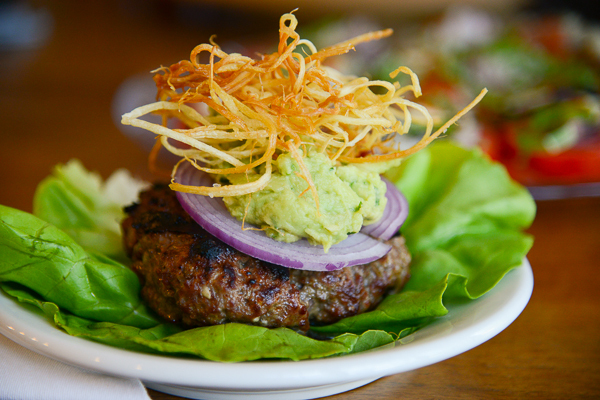 This burger recipe is a perfect example. They are incredibly juicy and have a really nice flavor without being too over-the-top. The burgers are served wrapped in a bibb or romaine lettuce leaf, as I’ve pictured here. However, if you must have a bun for your burger, I recommend having the parsnip shoestrings on the side rather than on the burger. Instead of mashing the avocados for the garnish, you can also use 1 cup of your favorite guacamole. I really like the fresh guacamole from the local Whole Foods. Cut the parsnips into long shoestrings with a julienne peeler or spiral slicer. Set aside. Combine the ground beef, onion, mustard, garlic and salt and pepper in a large bowl. Divide the meat mixture into 6 patties, making a small indentation in the center of each one. Grill the burgers to desired level of doneness. We found that 6 minutes covered on the first side and three minutes covered on the second side resulted in a medium-rare burger, but your grill might be different. Do what works for you. While the burgers are cooking heat the coconut oil in a saucepan until one of the shoestrings sizzles when dropped into the oil. Fry the shoestrings tossing with a fork until golden brown. Remove them from the oil and place on a paper-lined plate to drain. Sprinkle with salt while hot. When the burgers are done, allow them to rest for 5-7 minutes. 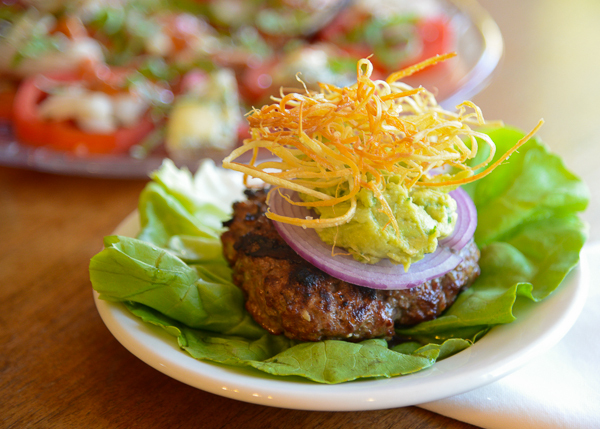 Place the burgers on a lettuce leaf, top with red onion, avocado or guacamole and parsnip fries. Adapted from PaleOMG. I think this recipe is also included in Juli’s latest book, The Paleo Kitchen.